It is now our second day in Paris. 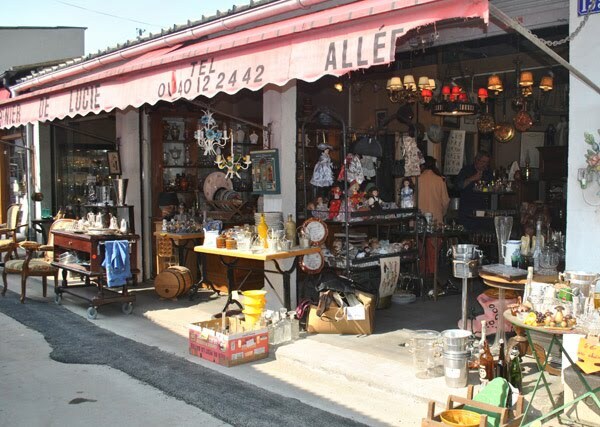 Today we began early with a long subway ride to the largest flea market in Europe, Clingancourt. Coming from a smaller town in America, I really couldn't imagine what this would be like. But it is miles and miles of stalls, and alleyways to more stall with stalls on them! The pictures below may give you some idea of it. I really couldn't have seen even a 1/4 of them in one day. 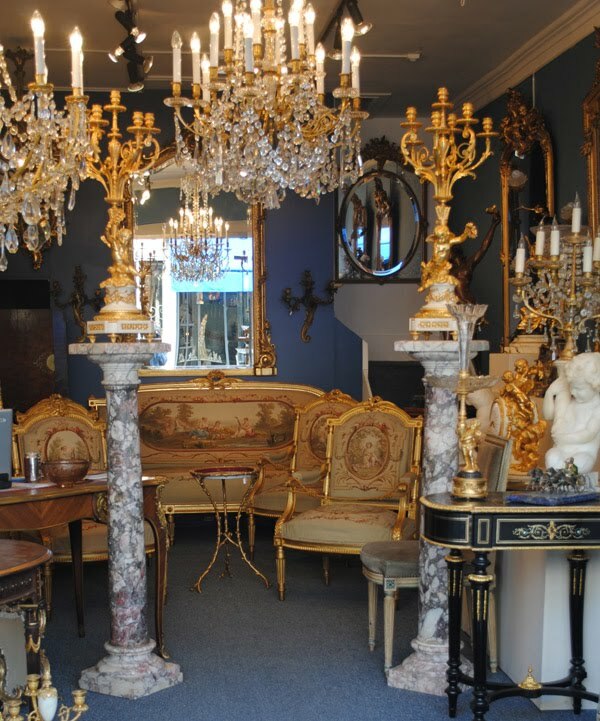 There is a great deal of furniture, and even chandeliers. The antiques here are much older than what you ususually see in the States. 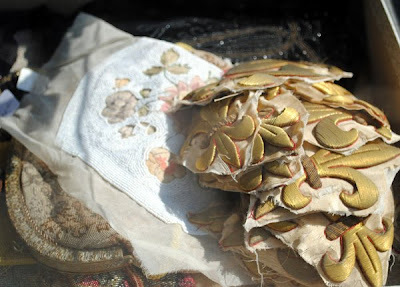 There were a number of stalls devoted to antique lace, ribbon, and textiles. I was drooling in them! You may be stunned to hear that I did not purchase a thing today! 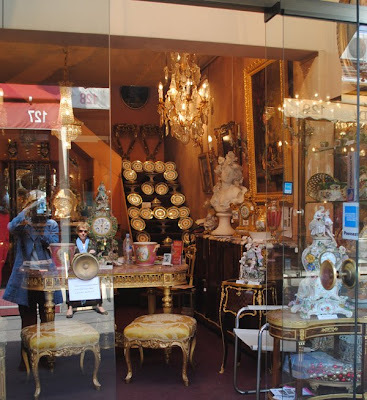 I have to say that I was overwhelmed with how much there was to look at, with my inablity at this time to speak French, and noticing that the prices were truly sky high. I had heard Paris was pricey, but a antique lace shawl for 600 Euros??? I have seen some like that back home, not many, but you wouldn't pay over $200. 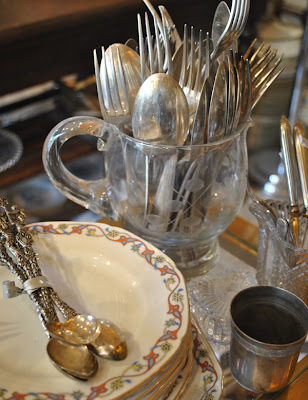 There were stalls with buttons and beads, silverwear, china, and just about every thing else. There was a tea cup or two I was considering, they were Limoge, and only 20ish euros, but I forgot where I saw them! And that is o.k. I think today I was just getting the feel of it. 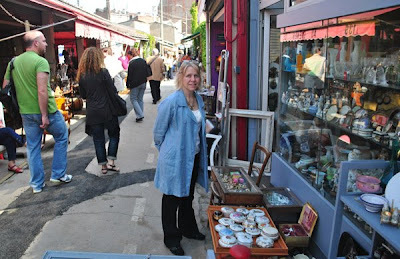 There are plenty more markets in Paris, and I will likely visit them next weekend. I did not even step into these shops as the items were over the top extravegant and I was sure their prices were as well! I didn't truly comphrehend that I was in Paris until today, when I stood beneath the Eiffle Tower. It really hit me that I was Here, Now! It was a magical feeling as the tower began to light up! Wow! That is a memory! The tower is gorgeous....just as I thought it would look like, but it is so stunning to see it up close! 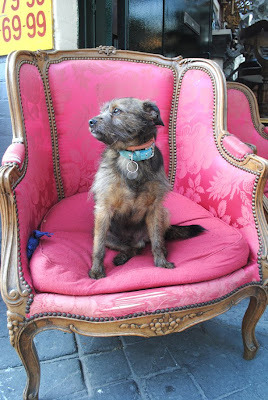 And now I will leave you with Lulu, a very regal canine, on her throne. I so enjoyed your post! I lived in Portgual and Spain for many years and have an appreciation for how rich Europe is in history. Of course being young when I was living there I didn't appreciate it as much as I do now! What a fab photo under the lit Eiffel Tower and I just LOVE that chair that Lulu is sitting in! Oh Terri, what a wonderful post. Thanks for sharing with us. I can't imagine seeng all this beauty every where you look. Have fun!! Thanks for taking us on your trip to Paris. What wonderful photos!! I am having such fun on YOUR trip!! And we went to the Eiffel tower, yeaaaaaa, I've always wanted to do that. Looks like you are having a wonderful time, I am sure it is sooo overwhelming, so much to see. Just enjoy yourself. How marvelous you get this chance. Hi Terri...wow..Fabulous!!! Wonderful post! Super inspiring..love the pup at the end!! Quite the little king! Enjoy your trip!! yay! Oh my I can tell you are having a truly wonderful time! Great posting. 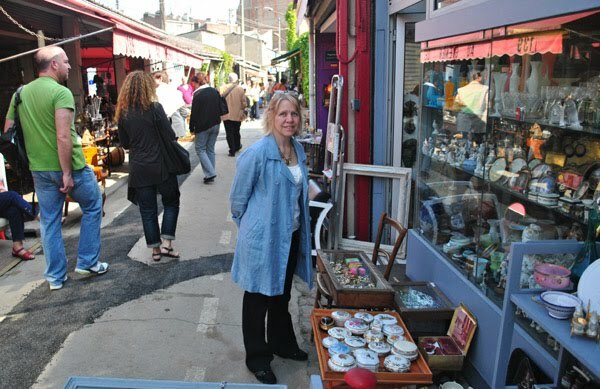 Thank you for taking us to the flea market with you, Terri! What a shame that the prices are so ridiculously high. Maybe you can find some reasonable priced treasures next week. Terri looks like a wonderful time. I love the Eiffel Tower picture and hope someday to go there. I look forward to your next post. Oh, what beautiful photos! It sounds like you're overwhelmed but having a good time. Looking forward to upcoming posts. be sure to make a special trip to see the Eiffel Tower after 9:00 when the lights are on!!! Wow, how wonderful!! Here I thought I could find great deals in Paris!!! In a way it's good to hear because I won't be so so envious...LOL Thanks for sharing...love the pics and will keep coming back! *SIGH* Talk about shopping Heaven!! It sounds wonderful!! Jealous! Totally happy for you Terri. :) God bless. LOL -- I told you about that Tower and your feeling when you see it for the first time twinkling! I'm so happy you are having such a grand time! Lovely pics! I'm having so much fun "tagging along" with you. The flea market is fabulous!! It's lovely to see your adventure unfold and the sweet shot in front of the tower all lit up. Make sure you rest in between your trips out and about. I will never get to Paris as I am deathly afraid of flying so thank you so much for sharing your trip with us!! I am really enjoying your posts from Paris!! Please show us more!! So so loving your posts Terri! The markets and shops look positively fabulous!! And the Eiffel Tower.. how wonderful! Looking forward to seeing more soon.... surprised the markets are so expensive.. but a good thing to know for the future! But wow those markets look amazing!!! Enjoy my friend... every moment! It's beautiful, and I'm so excited for you! WOW! What a magical place. I've done that before, come up empty handed because i am so overwhlemed with all that I see. Glad you are having the time of your life, and appreciate you taking the time to share your travels with us. Look forward to mroe pictures! 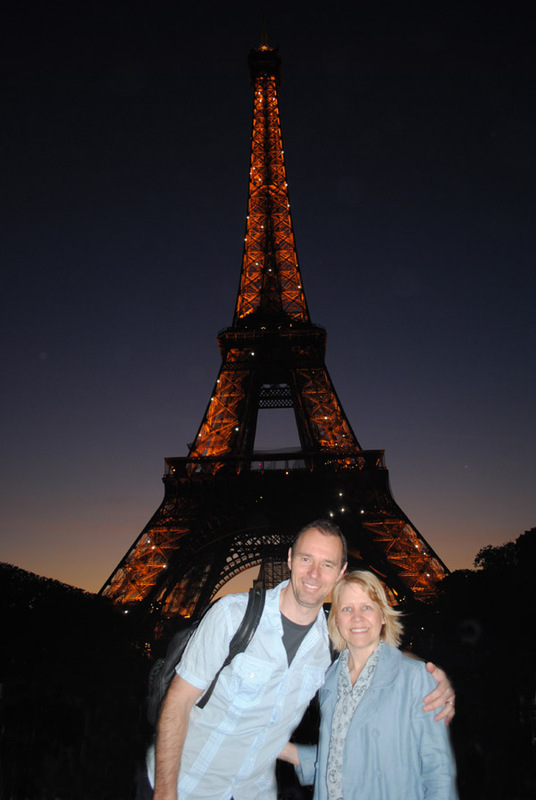 Such a beautiful picture of you two under the prettiest tower in Paris! Truly romantic! The feeling of being overwhelmed by ALL that STUFF ~ I'm chuckling! You don't know which way to look, it all looks the same, and you forget exactly what you DID see! And their prices ARE high, I know! 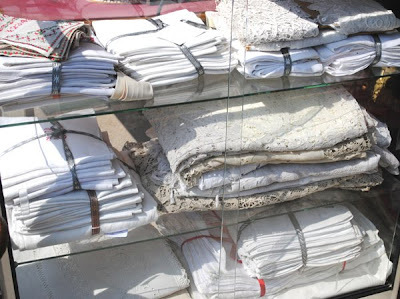 But you'll find just the perfect things to bring home with you...including some beautiful memories! Gale and I are having a splendid time and are thinking of you! So glad you are enjoying yourself. And thank you so much for blogging the really wonderful photos. It is almost like being there, now if you could somehow manage to blog some pastries for us, a little vino - it would really be like we were there - LOL! Have fun and please continue with the photos. Your creative heart is certainly getting a tremendous boost here in Paris. Is it not surprising that the use of iron like the Eiffel Tower only started at the beginning of the 1900's?! I am sure that the rest of your time in Paris will be full of impressions. Have a wonderful time! You may not have actually purchased but I bet you got lots of ideas for doing your own thing! Beautiful photos Terri...it looks like you are having a fabulous trip! Love the pic of Lulu on her throne...have fun!! Tea Cup Tuesday From Paris! I'm just here for the joy!